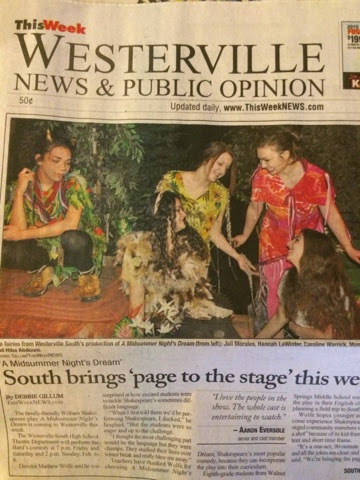 The family-friendly William Shakespeare play A Midsummer Night’s Dream is coming to Westerville this week. The Westerville South High School Theatre Department will perform the Bard’s comedy at 7 p.m. Friday and Saturday and 2 p.m. Sunday, Feb. 6-8. Director Matthew Wolfe said he was surprised at how excited students were to tackle Shakespeare’s sometimes difficult language. “When I first told them we’d be performing Shakespeare, I ducked,” he laughed. “But the students were so eager and up to the challenge. Teachers have thanked Wolfe for choosing A Midsummer Night’s Dream, Shakespeare’s most popular comedy, because they can incorporate the play into their curriculum. Eighth-grade students from Walnut Springs Middle School were reading the play in their English classes and planning a field trip to South to see it. Wolfe hopes younger audiences come experience Shakespeare and he urged community members to “give it a shot” because of its kid-friendly content and short time frame. A Midsummer Night’s Dream portrays the adventures of four young lovers and a group of amateur actors, their interactions with woodland fairies and a duke and duchess. Taking place in a mythical Athens and an enchanted forest, there is a handsome fairy king, a misguided parent, star-crossed lovers, a weaver who’s transformed into a half-donkey, wood sprites and elves. For nearly a month, the cast and crew have been staying after school and working hard every day on the production. Senior Gabby Robinson, who plays Hermia, said she loves the stage combat. Miranda Cotman, a senior, plays Oberon, Lord of the Fairies. After high school, Cotman plans on majoring in theater at Otterbein. “My favorite part is when I get to yell at and reprimand Jaii Morales’ character,” she said. Theseus, the Duke of Athens, is played by senior Aaron Eversole. He was in the One Acts last year and this is his first main stage production at South. He said people should come see the show because it’s hilarious. Jalissa Frye, a junior and the assistant tech director, helped build and design the set. The only guidelines given to students by Technical Director Derrick McPeak were that the set needed a ramp and a treehouse. Frye said the set went up “really, really fast” — in less than three weeks. About 60 students auditioned for the 32 roles. More than 50 students are involved in the play onstage and backstage. Tickets cost $6 and can be purchased at the door at South, 303 S. Otterbein Ave.